At the end of August we received the happy news that Ireland is allowing us to stay for a year, instead of the 90 days for tourists. Artemis and I were just saying the other day that we have loved every single minute of living here. We don't miss anything about our lives in the US except our friends. So I've been thinking a lot about friends. 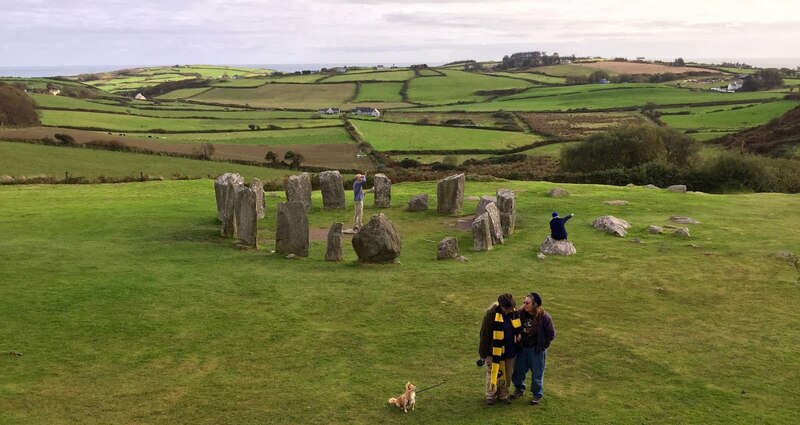 Friends are a lot like the stone circles of South-West Ireland. The good ones are hard to find. 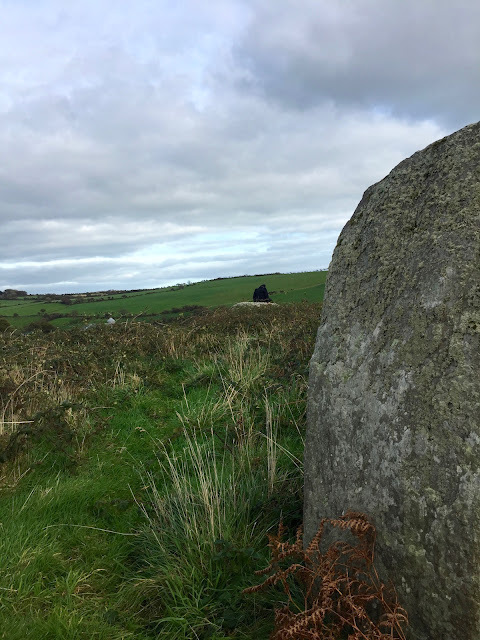 I mentioned before about finding Gurteen stone circle, and how even with GPS coordinates they sometimes remain hidden until you are right next to them. I have no idea where this circle is because this day we were not driving or navigating ourselves. I very cleverly dropped a pin into my phone maps when we were there so that I could find it again, but alas, it wasn't there when I looked for it later, and it has never shown itself on my phone again. As you approach a new one, you feel fear, elation, and a confusion of both. We approached from the west, climbing a gentle hill through the cow pasture, fields of green all around, but no circle or even stones of any kind. Suddenly, the circle appeared ahead of us on the near horizon. Its stones are unusual. One of them is entirely white quartz, and two of the tall ones are run through with veins of quartz. They are the kind of pretty stone you might pick up on the beach, except that they are 2 meters high. Teresa encouraged us to stand with our backs to each of them, feeling the energy, and how the energy of each of them is different. They tell you things about yourself that you never expected. She also suggested that we lie down on our bellies in the center of the circle and listen to a message. I did, and was told simply that I am where I am supposed to be. Nothing new there, thankfully. The dolman is visible just between those two pillars on the right. Just outside the circle is a dolman. Recently there has been debate among the archeologists about dolmans. Are they boulder burials? or are they something else that people happened to get buried under? A similar question would be: is the purpose of a church a place of worship, or is it to sanctify the cemetery? Experts disagree. Teresa's view is that stone circles are of earth, and dolmans are of sky. She suggested doing what I never thought of before, which is to lie on your back on a dolman to receive the sky messages. I asked later "like a satellite dish?" and she said that she'd never thought of it that way, but that would be a good analogy. One of us, not me, on the dolman. "See this? magic is real. Stand by for more transmissions." You can't just follow directions and find them. 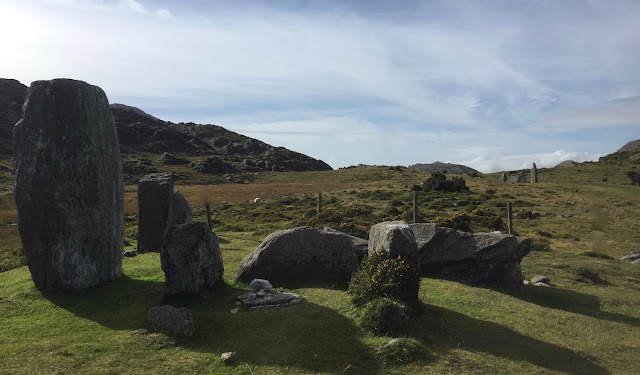 Cashelkeelty stone circle is located on the Beara Way, a popular hiking trail, and the directions toward it include a car park on a main road, so I had every expectation that finding Cashelkeelty stone circle would be a cinch. 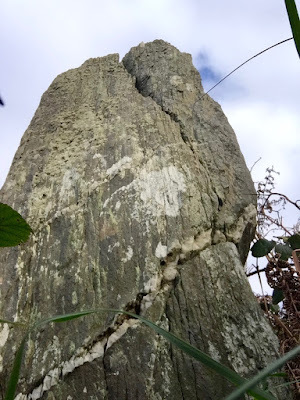 Here's a link to the megalithic website about Cashelkeelty, and here's a link to the megalithomania listing. I did not read the megalithomania listing before going, because of the usual fog that comes over me when researching these places. I just trusted to the idiosyncrasies of Meehan's Sacred Ireland. Because it seemed like it would be a cinch. 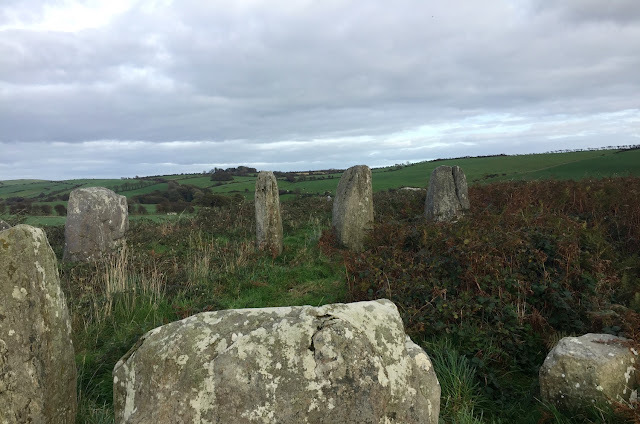 I suggest reading the The Mega-What listing for this circle, and all the other ones, because that site is well organized and its author has calculated the solar holiday aspects, relating stones in the circle to locations on the horizon. The author also categorizes circles as "multi-stone" or "five stone." Uragh stone circle. 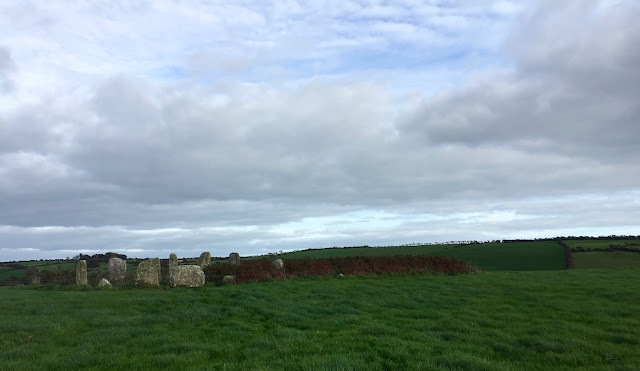 Not otherwise described in this post, but a lovely five-stone circle with pillar. 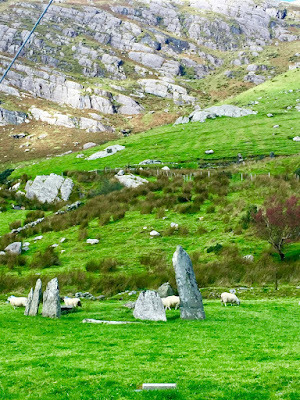 Stone circles of SW Ireland have always an odd-number of stones, and the smallest ones have five. 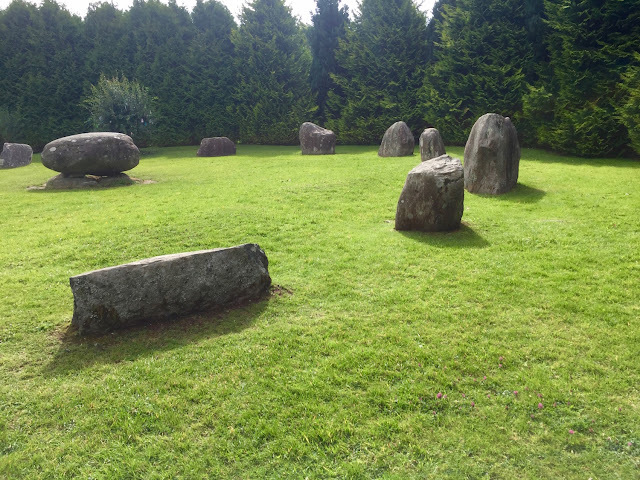 The author of this site proposes that the five-stone circles are an early example of a technology being miniaturized as it evolves. I'm sure experts disagree. The path to Cashelkeelty stone circle. The instructions said: "from the car park, pass over the wall, through the forest, and past the waterfall to the track." There was no wall anymore, the path divided several times, but along a stream, and is that the waterfall? or is it was further along? and now the path is leading toward a wall, is that the wall? and then our party split up to scout, and I marched a kilometer up a hill and then suddenly I was alone at the top of a mountain, just me and a 5-stone circle, the wind, and the sky. Cashelkeelty stone circle, with stone row behind it. Some of best ones connect you with new ones and amazing adventures. Note the Racah Way sign, taking you to the murderer's den. 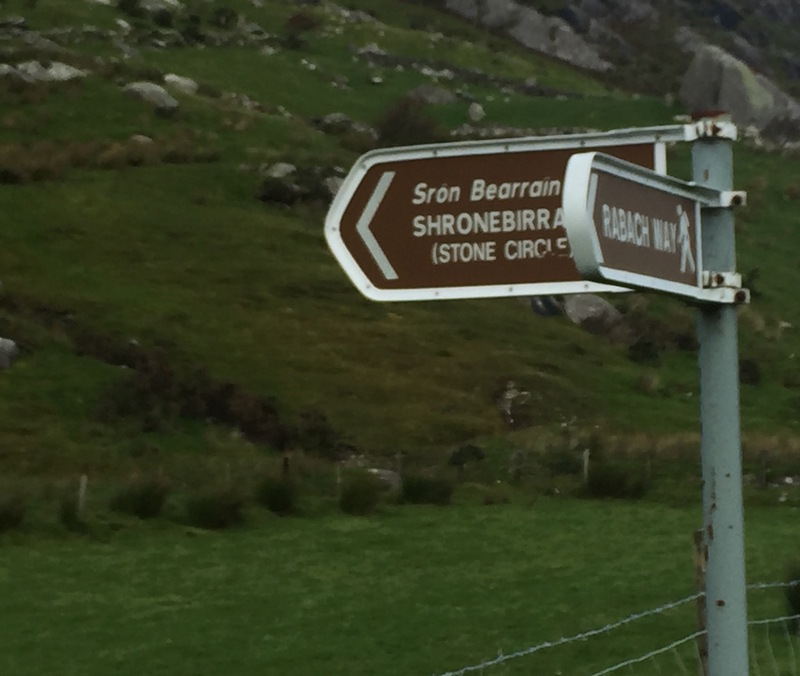 On the way to Cashelkeelty, we saw a sign for a stone circle that we hadn't heard of before: Shronebirrane. We drove down a long narrow lane to the end of a narrow valley. Just the kind of place where outlaws hid out. In fact, there is a famous story about a murderer who hid for months in this small valley, a murderer known as The Rábac. 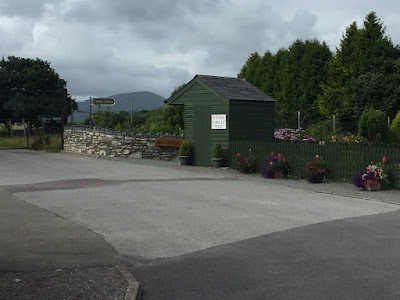 The Rábac, whose surname was O'Sullivan like everyone else in this part of the Beara, was a member of a family known for being "active" which perhaps means "criminal." An unfortunate sailor came to their door, and asked to spend the night. The family conspired to murder him and take his money. As The Rábac slit the sailor's throat in the middle of the night, a woman passing the window on her way to the well witnessed his dark deed. She was troubled by this knowledge for a long time. She didn't want to tell anyone because she knew that The Rábac would slit her throat. But she continued to be troubled by her conscience, and couldn't make a good act of contrition, so she asked her Priest what she should do. The priest told her to tell everyone what she had seen so that all her sins could be absolved. Sure enough, soon after she told her tale and word got around, as she ascended the mountain to milk the cows, with a spancel in her hand, the Rábac grabbed the spancel from her. A spancel is a bit of rope used to hobble a cow as you milk it in the field. The Rabac put the spancel around the woman's throat and tried to choke her to death, saying "Now I will have my revenge for telling." He choked her, and caused her great pain, but she would not die. Why not? Because she was wearing a brown scapula. (A scapula is a bit of string with two felt rectangles at either end, worn around the neck for protection. When I was given one as a child, I was told that I couldn't die if I were wearing it.) The woman asked The Rábac to take off the scapula. He did, and he could then kill her. So he killed her. However, there was a man minding sheep nearby, and he witnessed The Rábac choking the woman who witnessed to the murder of the sailor. He kept the story to himself for twenty years. But then, when he was injured in a mine accident and on his deathbed, he confessed to a priest that he had witnessed the murder by The Rábac long ago. The priest told him to make the story public, which he did. And then he died of his injuries. The Rábac left the village, and hid away in the hills for nine months in a place known as The Rábac's Den. One of the sons of the murdered woman, who was grown by now, put the new information about his mother's murder together with what was well-known about The Rábac, and told the guards that the murderer would be visiting his family at Christmas. Or maybe the story was that he would be visiting his family when his child was to be born. No matter. The guards surrounded the house, and the son of the murdered woman went in with a four-pronged pike. The Rábac, who also had a pike, attacked the son, but the son wrenched the pike out of The Rábac's hands, and the guards rushed in and arrested him. The Rábac was taken away to Tralee and hanged until dead. Now, wasn't that a great story? Didn't you learn something useful about the advice of priests? You can read one version of the story here on Duchas.ie. Where was I? We drove down the Drimminboy Valley to the end of the road, and there in the backyard of a perfectly prosaic 1970s bungalow is the Shronebirrane stone circle. It's on private land, and at some point in the past the landowners have asked people to pay a little money to trespass closer to the circle, and to visit an old village further up into the mountains. We weren't sure what the deal was, and nobody seemed to be around, so we ate a lovely little cheese and apple tailgate picnic and observed the circle from the road. 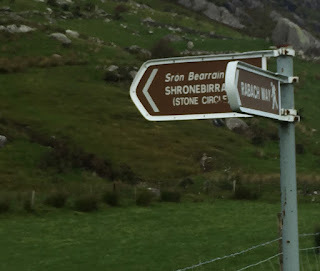 Here is a link to the Megalithic Ireland entry about Shronebirrane. The entry at Mega-What describes tons of celestial correspondences between stones and sunsets, but I'm not interested enough to work it out. They are a mystery. No one knows where they came from. I guess I could get interested, but these days I'm satisfied with not learning very much on the science side of things. I have read through the Mega-What site, and learned a few things that make sense given what I've observed. Stone circles are found on low hilltops with the horizon all around. I've read speculation that Neolithic magic happens underground, like in passage tombs, but in the later Bronze age, people turned their attention to the sky instead of the earth. The site has an explanation of what the author calls the Megalithic solar calendar, which predicts seasons and probably is related to agricultural activity, and the Megalithic lunar calendar, which predicts eclipses and is related to political activity. (See my post "Predicting the Eclipses." Is any of this accurate? Who knows? Some are manicured, tamed, popular, and ultimately not satisfying. Tourist materials claim Kenmare stone circle is the largest stone circle in south-west Ireland. Biggest doesn't mean best. But it was the first one I met, and for thousands of people it may be the only one they ever meet, and I would never want to keep the experience from them. I feel the same about those giant tour buses. If this is the only way people can visit Kerry then I won't disparage it. It's just... not optimal. 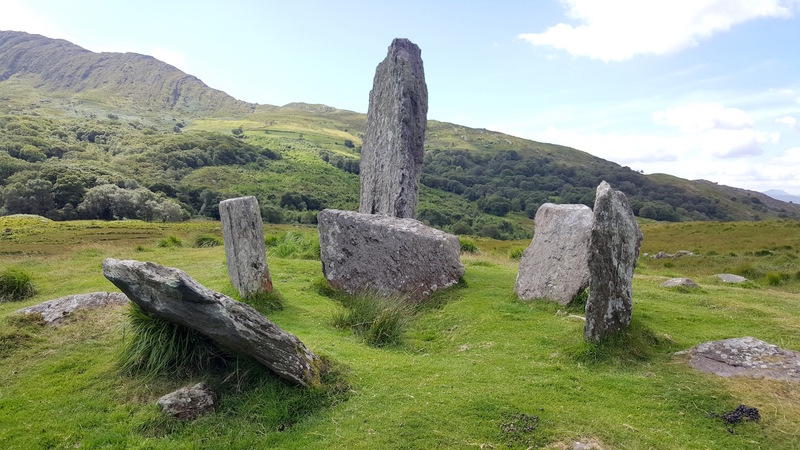 The Kenmare stone circle can be hard to find, even though there are more signs now and it's just at the edge of town, just a short walk from Kenmare Square. When I first visited it about ten years ago, you could see how it was built on a low hill between two rivers, with the horizon all around. 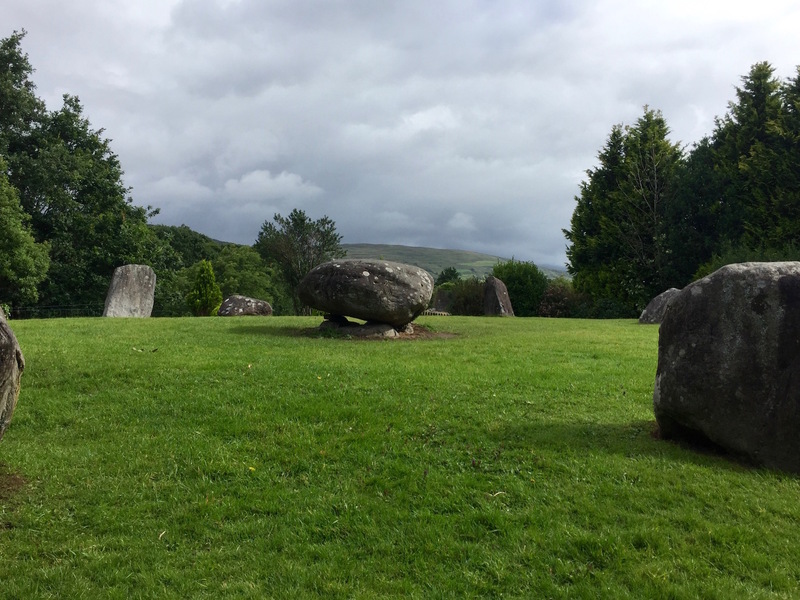 But someone planted a shrubbery around it, and blocked the view of the hills, clearly not understanding that stone circles are about the horizon, not the stones. Perhaps they are keeping it out of sight so that those who have paid €2 know they have received something for their money that they couldn't get otherwise. Sometimes good ones are right there in your own backyard. 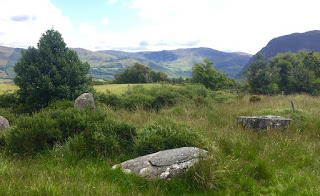 Another stone circle that many people visit is near Kenmare, in Bonane on the road toward Bantry. I've written about this stone circle before, because we watched the Summer Solstice sunrise from it. It was discovered recently. 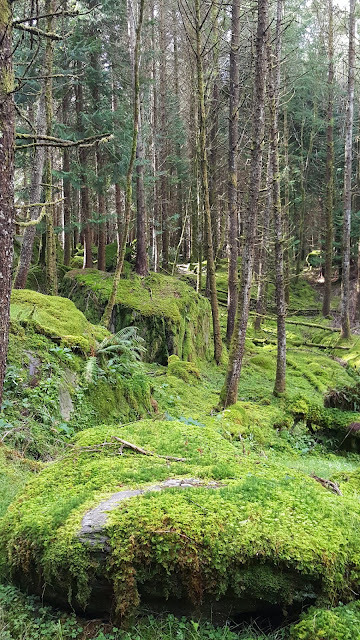 When the circle was rediscovered in the 1990s, it was still in the forestry. You can read on their website how Danny O'Conner discovered the circle, or better, listen to him tell his story here. Once You Know and Love Them, You Will Always Miss Them. Ourselves at Drombeg stone circle. This post is about stone circles because I'm missing my friends. 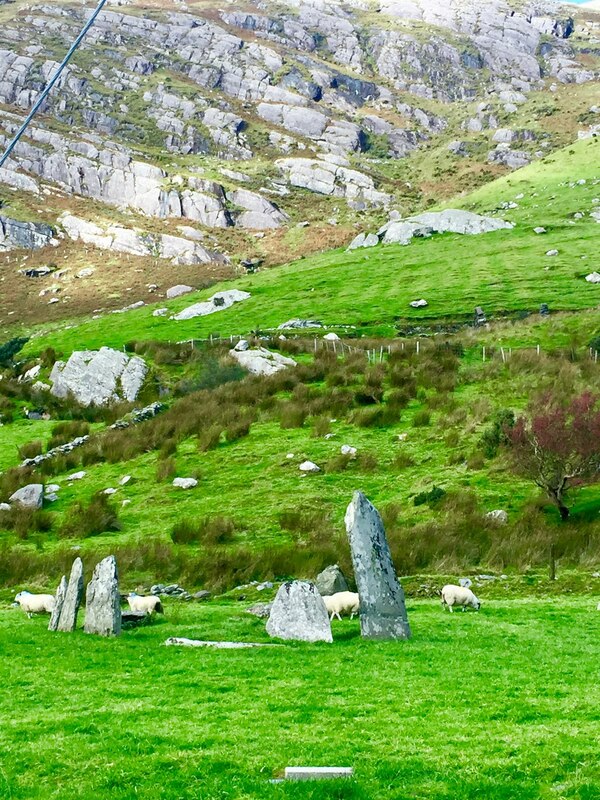 We will soon be missing stone circles too because it looks like we will be leaving Kerry in a few weeks and moving to a part of Ireland that doesn't have as many. More about that soon. Publishing this post was delayed because after I had written most of it a few weeks ago, I clicked something on the webpage I was composing it on and it suddenly reverted to the very first rough draft. I have no idea how that could happen. Except that perhaps I was writing about things that should have been left unwritten. So this post contains What Is Allowed, to Keep All Things In Right Relationship.